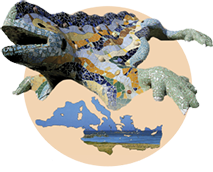 The Barcelona Knowledge Hub of the Academia Europaea announces the organisation of its 3rd modern-day Disputatio of Barcelona, which will be held on 9–11 December, 2015. The Disputatio of Barcelona will take place within the framework of the Disputatio Week of 2015, which will include different scientific and social activities. 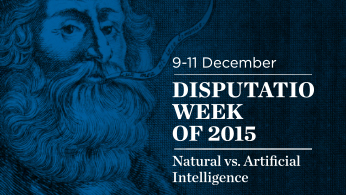 This year’s topic will be Natural vs. Artificial Intelligence. Location: the Institute for Catalan Studies. The Barcelona Knowledge Hub (BKH) has been operational since 2013. It is the Academia Europaea’s office for the Mediterranean and Southern European region. The BKH focuses on the promotion of activities of interest for the members of the Academia and the scientific community of the region, with special emphasis on multidisciplinary scientific activities that include the perspective of the natural sciences, social sciences and the humanities. The BKH’s goal is to contribute to the consolidation of a genuine European area of innovation, research, and education, especially in the Mediterranean and Southern Europe. The BKH is supported by three local partners: the Government of Catalonia, represented by the Ministry of Economy and Knowledge, through the Secretariat of Universities and Research, the City Council of Barcelona, and the “La Caixa” Foundation. The hub counts on the collaboration of the Institute for Catalan Studies, on whose premises the hub’s office is located. The current Academic Director is Prof. Ricard Guerrero, Professor Emeritus of the University of Barcelona and Adjunct Professor of the University of Massachusetts-Amherst, and Member of the Organismic & Evolutionary Biology Section of the Academia Europaea. In the scholastic system of education of the Middle Ages, the Disputationes offered a formalised method of debate designed to uncover and establish truths in theology and in sciences. Fixed rules governed the process: they demanded dependence on traditional written authorities and the thorough understanding of each argument on each side. The famous Disputatio of Barcelona, convened in the summer of 1263 by King James I of Aragon, was the most important and well-known of the inter-faith Disputationes that took place between Christian and Jewish theologians in the late Middle Ages. In 1263, the disputants were Friar Paulus Christianus (Dominican, and a converted rabbi from Judaism) and rabbi Moses ben Nachman (also known as Nachmanides), from the Girona community, the most important scholar of Judaism in his time. They discussed theological questions in front of the king and his court, in the presence of the most important men of the prosperous and influential city of Barcelona. The modern Disputatio of Barcelona has successfully been recovered. In November 2013, the BKH celebrated its inaugural event by commemorating the 750th anniversary of the medieval Disputatio, and organised a modern-day Disputatio on “Social and state-of-the-art Medicine”, featuring philosopher Thomas Pogge (Yale University; Leader of the Health Impact Fund) and neuroscientist Mara Dierssen (Centre for Genomic Regulation, UPF, Barcelona; President of the Spanish Society for Neuroscience). After the success of the Disputatio of Barcelona 2013, the Barcelona Knowledge Hub of the Academia Europaea organised a second modern-day Disputatio of Barcelona, on the topic “The Mediterranean, bridge of cultures” in November 2014, together with the United Nations University Institute on Globalization, Culture and Mobility (UNU-GCM). Two MAE, Maria Paradiso, geographer, Professor of Geography and Planning at the University of Sannio, Italy, and Enric Banda, geophysicist, Director of Science and Environment at the “la Caixa” Foundation, Barcelona, presented two views of the topic, covering many different aspects of the Mediterranean history, culture, opportunities and present difficulties. This Disputatio of Barcelona 2014, was as successful as the first one. We consider that the modern-day Disputationes are a distinctive feature of the BKH, and must be continued in future years. The Disputatio of Barcelona 2014 was held on the 27th of November at the Saint Pau Historic Site, Barcelona, where the UNU-GCM is located.